Tel: 03-8074 0073. Business hours: 11am-3pm, 6pm-10pm daily. Closed on alternate Wed­nesdays (note: date not fixed). APART from savouring the ever-popular satay, a trip to Kajang would not be complete without Sup Pedas, or hot and spicy soup (lat tong) — just one sip is enough to set tongues on fire and eyes watering. Those who crave a lat tong (top pic) fix without having to travel far can have it at Ju Yuan restaurant in Bandar Puchong Jaya, Puchong, which dishes out Kajang’s signature peppery hot soup. The restaurant is not new, having operated for four years; but was taken over by the husband-and-wife team of Aileen Lee and Lawrence Hor eight months ago. It has since been renamed as Ju Yuan, even though the signage still reads ‘Sup Pedas Kajang’ so as not to confuse customers. “We have retained the chefs and recipes handed down by the previous owner, while expanding our offerings to feature new dishes,” said Hor. The most popular item on the menu is the hot and spicy soup, which Hor said the previous owner learnt from lat tong gurus in Kajang. 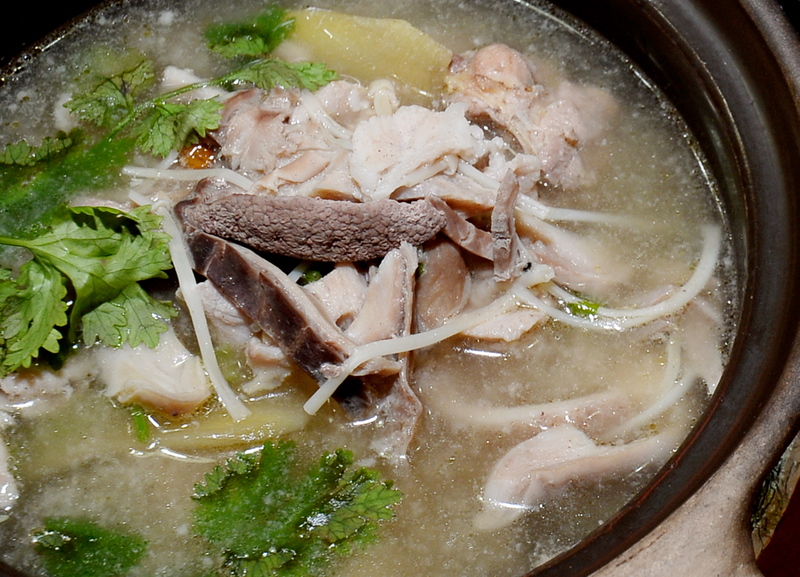 Chock-full of ingredients, the soup is served with kampung chicken, pork and innards such as liver and stomach, needle mushrooms, wolfberries, ginger and Chinese parsley. Restaurant Ju Yuan also offers standard Chinese restaurant (tai chow) fare, such as stir-fried french beans and cabbage. Having somewhat mild tastebuds, I was worried about breathing fire right after my first mouthful — but was pleasantly surprised to find that it was not too spicy. The pepper soup was flavourful but not to the point of reducing me to tears, while the offal was clean-tasting with no hint of gaminess. Hor said customers who liked their food spicier could request for more pepper to be added. “We grind the peppercorns in-house, and our ingredients are freshly delivered from our suppliers daily,” he said. The soup base is prepared fresh every morning, then cooked to order in a claypot which seals in the flavours and gives it a more fragrant taste. There are two other non-spicy soup options available, bittergourd soup and fish ball dumpling soup. Ju Yuan also serves standard Chinese restaurant fare (tai chow), with meat, seafood, tofu and vegetable options. One of my favourites was the claypot roast pork, a new addition to the menu which was created by the couple. Claypot roast pork is one of Aileen Lee and Lawrence Hor’s creations and a new item on the menu at Ju Yuan since they took over the management eight months ago. The pork has a crispy skin, is well-marinated and full of flavour. The roast pork, cooked with thick soy sauce, onions, scallions and birds’ eye chilli, was well marinated and full of flavour, with a balanced ratio of lean and fat meat coupled with a slightly chewy texture. “One of our customers tried a similar dish in Seremban and told us about it, so we decided to offer it here. “We went to many roast pork vendors to learn their ‘secrets’ and through trial and experimentation, came up with our own version,” said Hor, adding that one technique was to poke holes in the skin before putting the meat into the oven to ensure crispiness. “The pork should sit on a bed of onions to soak up the flavours and keep it moist. We prepare the roast pork ourselves and it takes up to one-and-a-half hours,” he said. The 18K Hotpot is also popular with patrons. 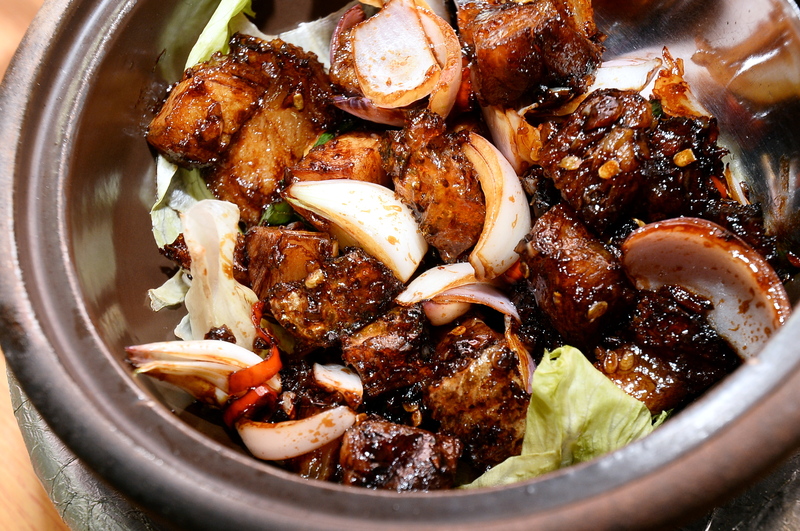 Pork belly is cooked in black sauce, onions, a pinch of sugar and lots of sliced birds’ eye chilli. The dish is supposed to be very spicy, but to cater to our tastes, they cut down on the chilli. It might have been a little oily, but it was definitely tasty. Another non-spicy option would be the Belly Hot Pot with salted fish. The steamed red tilapia’s simple presentation was quite deceiving, as the fish was sizable and had sweet, tender flesh enhanced by the soy sauce. 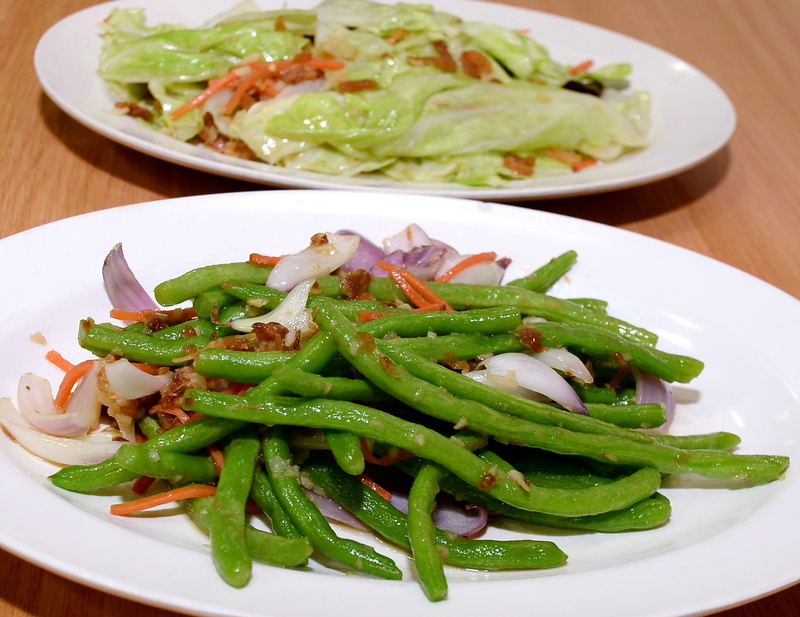 We also tried stir-fried french beans with onions, sliced carrots and dried shrimp (har mai), stir fried cabbage, and spicy shrimp with chilli. These tasted like standard restaurant fare. The claypot tofu is slightly different as it uses pork belly instead of the usual seafood ingredients, along with button mushrooms, capsicums, green peas and needle mushrooms.